Jan. 3, 2018 -- Fruits, vegetables, whole grains. That’s the winning trio found in both top diets from the 2018 U.S. News & World Report annual ranking of diets. This year, the Mediterranean and DASH diets tied for first place in the best diet overall category. DASH stands for dietary approaches to stop hypertension. It emphasizes eating whole grains, fruits, and vegetables, and limiting salt. The National Heart, Lung, and Blood Institute came up with it to help people lower their high blood pressure. 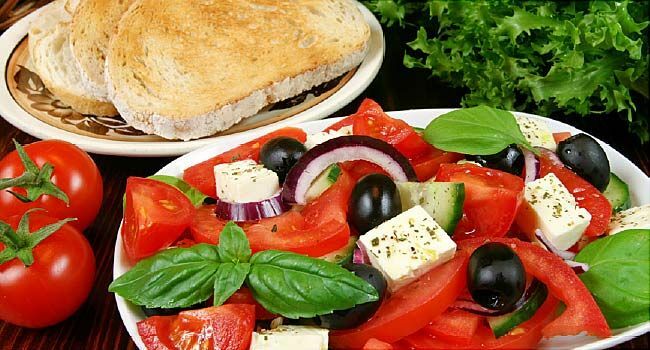 The Mediterranean diet also emphasizes fruits, vegetables, and whole grains, with moderate alcohol intake. Both include lean proteins such as chicken or fish. The magazine also ranked both as easiest to follow, with the Mediterranean diet claiming first place and the DASH diet fourth. Both also tied for first place as best for people with diabetes and claimed top spots in some of the other categories. This year, the publication ranked 40 different diet plans. It based the rankings on input from an expert panel of the country's top nutritionists, dietary consultants, and doctors who specialize in heart health, weight loss, and diabetes. The experts considered how easy a diet is to follow, the likelihood of both short-term and long-term weight loss, and how effective it is against heart disease and diabetes. There is no single diet that is best for everyone, says one of the experts, David Katz, MD, director of the Yale University/Griffin Hospital Prevention Research Center. The best one, he says in a statement, is ''one that can be adopted, managed and sustained over time." Another expert not involved in the rankings applauded the focus on healthy, not fad, diets. "2018 seems to be starting off as the year of fad diets, so it is good to see the U.S. News Best Diet list recognizes that to achieve weight loss, and be healthy, an eating plan needs to be flexible, well-balanced and maintainable," says Connie Diekman, director of university nutrition for Washington University in St. Louis. "The list of best diets recognizes that the Mediterranean diet and the DASH diet, which are very similar in concept, meet those three factors," she says. The rankings give people a choice of healthy plans, says Katherine Brooking, a registered dietitian and nutrition blogger for WebMD. "I'm thrilled to see the Mediterranean diet tied for the #1 spot overall," she says. "Studies consistently show that the Mediterranean pattern of eating is strongly related to a reduction in many chronic diseases -- including heart disease, diabetes and certain cancers." It is also easy to adopt, she says, and can be delicious. Other best overall diets include the Flexitarian diet, Weight Watchers, MIND diet, TLC diet and Volumetrics. The Flexitarian diet is a mostly meatless plan that emphasizes plant-based foods. Weight Watchers focuses on healthy eating, with point values assigned to foods and a daily point limit. TLC stands for therapeutic changes for high cholesterol; followers exercise more and lower saturated fat. The MIND diet combines parts of the DASH and Mediterranean diets and aims to improve brain health. Best commercial diets: Winners include Weight Watchers and Jenny Craig for first and second. Jenny Craig provides low-calorie packaged foods and consultant support. The Flat Belly diet and Nutritarian tied for third. The Flat Belly plan focuses on eating healthy, with monounsaturated fats such as from olive oil and nuts and setting a 1,600-calorie daily limit. The Nutritarian diet emphasizes a plant-based plan with ''anti-cancer super foods." Best weight loss diets: Winners were Weight Watchers, Volumetrics, Jenny Craig, Vegan, and Flexitarian. Volumetrics focuses on eating foods that fill you up, such as broth-based soups, fruits, and non-starchy vegetables such as tomatoes and mushrooms. Best fast weight loss diets: Winners are the HMR diet, Weight Watchers, Biggest Loser, Medifast, SlimFast and Volumetrics. The HMR diet is a low-calorie plan with meal replacement shakes that focuses on fruits and vegetables. The Biggest Loser includes eating regular meals with lean protein, fruits, and vegetables and keeping a food journal. Medifast starts with five meal replacements a day and one meal, with more meals phased in as weight is lost. SlimFast is a program of meal replacement shakes. Best diets for healthy eating: Winners: DASH, Mediterranean, Flexitarian, TLC, Mayo Clinic, MIND, Volumetrics, and Weight Watchers. The Mayo Clinic diet focuses on healthy lifelong eating. Easiest to follow: Mediterranean, Flexitarian, Weight Watchers, DASH, and MIND. Best for diabetes: After the two first-place winners, DASH and Mediterranean, came the Flexitarian, Mayo Clinic, Vegan, Volumetrics, and Weight Watchers diets. Best for heart disease: DASH claimed the top spot, followed by Mediterranean and Ornish (tie for second) and TLC. Flexitarian, MIND, and Vegan tied for the fifth spot. The Ornish diet ranks foods from healthiest to most indulgent, encouraging followers to emphasize the foods from the healthiest group. Best plant-based diets: The top five are the Mediterranean, Flexitarian, Ornish, Vegetarian, and Traditional Asian diets. The Traditional Asian plan includes low-fat eating with little red meat and plenty of fresh fruits, fish, and vegetables. For the overall diet category, the Dukan and Ketogenic diets tied for last place. The Dukan diet includes lean protein and eliminates most carbs. The Ketogenic diet is also a low-carb plan. Whole30 and Dukan came in 13th and 14th, or last, for best commercial diets. Whole30 is described as a short-term reset and focuses on eating whole, nutrient-dense, anti-inflammatory foods. It doesn't allow legumes, grains, dairy, alcohol, processed foods, and added sugars. Besides the rankings, U.S. News offers information on finding the best diet for you. Don't go by popularity of diets alone, says Diekman. "Popularity of diet plans does not mean that those diets result in healthy weight loss," she says. "They might achieve short-term [weight loss] but the goal for weight loss is shifting the balance between fat and muscle to develop a healthier you." U.S. News & World Report: "Best Diets 2018 rankings." Connie Diekman, registered dietitian; director of university nutrition, Washington University, St. Louis. Katherine Brooking, WebMD nutrition blogger and registered dietitian; co-founder, App4Health.com.